If you read The Establishing Shot you will know that I have been looking forward to seeing the Designing 007 – Fifty Years Of Bond Style exhibit for months now - last week I shot up to the Barbican to view the collection in the very first session. Bear in mind that I have visited almost every James Bond related exhibition that has taken place over the last couple of years in London (not BOND IN MOTION as yet) and I may have been spoilt. I wasn't sure what to expect as intentionally avoided any bits prior to my visit to enjoy any surprises if you wish to do the same stop reading now and head over to the Barbican. The Designing 007 – Fifty Years Of Bond Style is exactly what is says on the tin -an exhibition dedicated to the elements of Bondology that have made James Bond such an enduring legacy (& longest running franchise) - the iconic look and style of Bond. 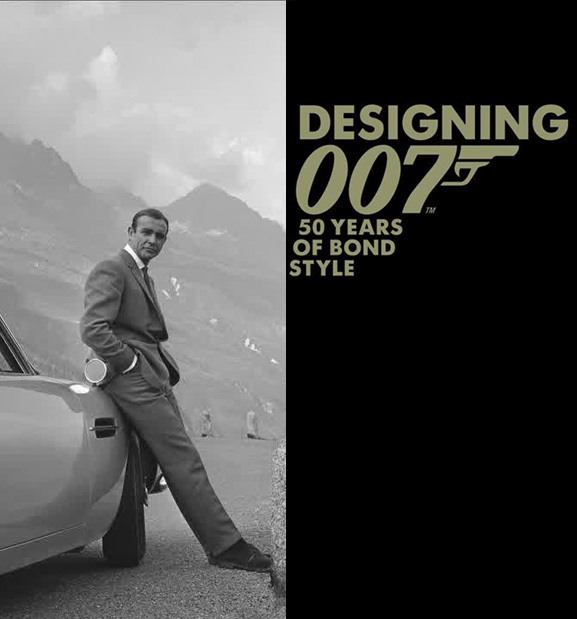 Designing 007 – Fifty Years Of Bond Style goes behind the curtains and looks at some Bond’s most iconic elements and the work and creative processes that goes into making them as memorable as they are. 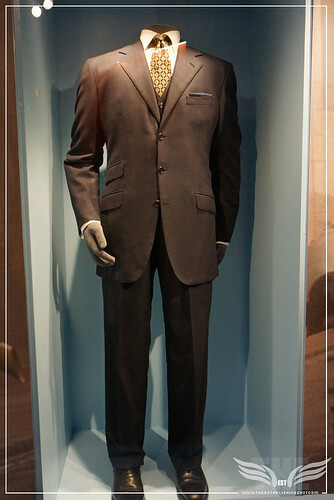 The exhibit looks at the design of the sets, outfits, characters, gadgets, look and feel of James Bond. The Barbican marks the 50th anniversary of the James Bond franchise, from 1962's Dr No to this year's Skyfall, with a unique exhibition showcasing the inside story of the design and style of the world's most influential and iconic movie brand. Created in collaboration with EON Productions by AB Rogers Design and curated by the Barbican, with guest curator fashion historian Bronwyn Cosgrave and Oscar winning costume designer Lindy Hemming. The exhibition is housed over two floors of the Barbican Centre and comprises of over 400 items from across James Bond’s 59 year career. The exhibition includes; gadgets, vehicles, props, costumes, video and sounds for an interactive celebration of Bond style see further below for more information on items exhibited. In case you are wondering Ian Fleming published Casino Royale in 1953 but the Barbican exhibition commemorates the 50th anniversary of the James Bond film franchise from 1962’s Dr No to this year’s Skyfall. The video below focuses on the creation of the iconic world inhabited by James Bond over 50 years. We spend time with award winning set designer, Sir Ken Adam; as well as Aston Martin’s Head of Design; along with the designers and the makers of the legendary Golden Gun. 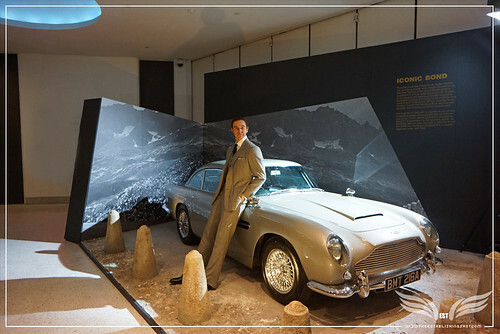 The Establishing Shot: Designing 007 50 Years Of Bond Style - James Bond (Sean Conney) Conduit Cut suit by Anthony Sinclair from Dr. No & 1964 Aston Martin DB5 from GoldenEye and Skyfall (Iconic Bond Area), a photo by Craig Grobler on Flickr. Heading to the Barbican’s Curve gallery where the bulk of the exhibition is on display across 11 main areas and 3 others, each covering an iconic theme and items pertaining to that theme. The 11 areas are: Fifty Years Of James Bond, Iconic Sequences, Title Sequences, Gold, Ian Fleming, M’s Office, Q Branch, Casino, Foreign Territories, Villains & Enigmas and Ice Palace. Full of pieces from James Bond history. The exhibition is cleverly thought out and beautifully put together with a rich range of items on display. Walking in off Silk Street past the Fifty Years Of Bond display you are greeted by the most iconic and stylish of all James Bond’s cars his DB5 used by Pierce Brosnan in the opening scene from GoldenEye. Which is retro fitted to look like the Goldfinger Aston Martin including the BMT 216A licence plate. The Establishing Shot: Designing 007 50 Years Of Bond Style - Curve Entrance (Title Sequences Area), a photo by Craig Grobler on Flickr. Walking through a gun barrel entrance into the Gold Area, which has a life size model of the Golden Girl Shirley Eatons’s Jill Masterson from Goldfinger which housed some great pieces like Scaramanga’s Golden Gun, golden hit records and a replica of Goldfinger’s jacket amongst others. 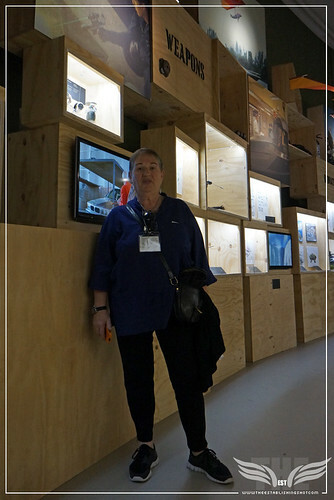 The Establishing Shot: Designing 007 50 Years Of Bond Style - Oscar winning Costume Designer Lindy Hemming in the Q Branch Area of Designing 007 50 Years Of Bond Style, a photo by Craig Grobler on Flickr. The Establishing Shot: Designing 007 50 Years Of Bond Style - Foreign Territories Display, a photo by Craig Grobler on Flickr. The Casino Area is beautiful and covered not only casino’s but the glamour of Bond nightlife in general with some stunning outfits and a recreation of the Casino Royale Black Jack table. The Establishing Shot: Designing 007 50 Years Of Bond Style - Honey Ryder Bikini, Jinx Bikini, James Bond Beach Shorts (Sunspel Recreation), James Bond (Daniel Craig) Swim Trunks, James Bond Dacor Scuba Mask & Anchor from Bond's Boat from Quantum Of Solac, a photo by Craig Grobler on Flickr. There are also Bond Lifts, the Bond Shop and after 5 you can pop into the Designing 007 Martini Bar for cheeky one. Designing Bond's Look from Barbican Centre on Vimeo. This video is a short study into James Bond’s personal style, meeting award winning costume designer, Lindy Hemming; and a handful of bespoke tailors who have been instrumental in shaping and crafting this icon of style over 50 years. The Establishing Shot: Designing 007 50 Years Of Bond Style - Curve Entrance Air Vehicles Models of James Bond Display, a photo by Craig Grobler on Flickr. 1. You can seethe iconic leather padded door of M’s office and right next to it M’s door from Skyfall. 5. Although not strictly from Skyfall you can see the James Bond’s DB5 used by Pierce Brosnan in the opening scene from GoldenEye. Which is retro fitted to look like the Goldfinger Aston Martin driven by Sean Connery including the BMT 216A licence plate - which is the same car design used in Skyfall. This is ambiguously titled in the exhibit but we confirmed this with the Designing 007 team. The Establishing Shot: Designing 007 50 Years Of Bond Style - James Bond Tank Costume from GoldenEye (Pierce Brosnan) (Foreign Territories), a photo by Craig Grobler on Flickr. 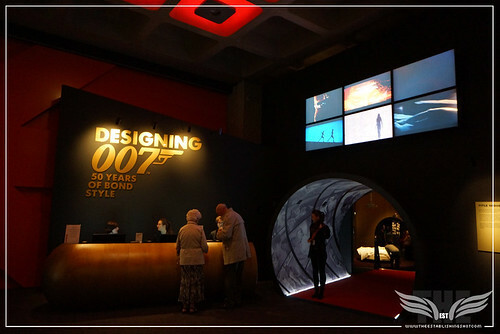 Overall the Designing 007 – Fifty Years Of Bond Style exhibition is a stunning look into the world of James Bond that will keep both Bondophiles and casual visitors enthralled. The focus of the exhibit is the style of Bond and much work has gone to making sure the exhibit looks good. The layouts and sets are absolutely stunning. For an exhibit focussed on style there are a surprising number of props and gadgets on display. Ranging from design work, concepts, costumes, props, gadgets as well as filmmaking memorabilia from Bond film shoots. 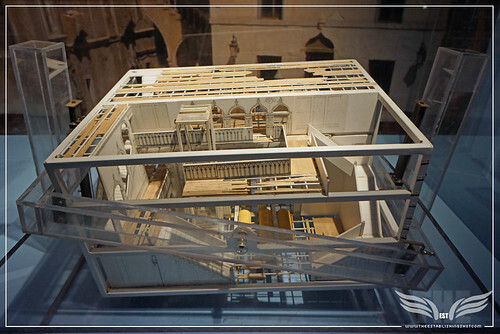 The Establishing Shot: Designing 007 50 Years Of Bond Style - Venice Sinking Palazzo Interior Model from Casino Royale (Foreign Territories), a photo by Craig Grobler on Flickr. Not as all encompassing as the Science Museum’s James Bond – the Official 007 Exhibition of 2003, it has a wider variety of items, albeit less detailed than the Imperial War Museum's 2008 For Your Eyes Only Ian Fleming and James Bond Exhibition. As a Bondologist it would been great to see more of the workings and creative process that went into making some of the items and outfits.There is an accompanying book to Designing 007 – Fifty Years Of Bond Style available that may explore this further but more detail would have been welcome. 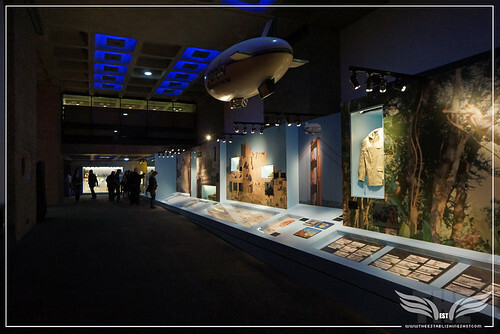 Designing 007 – Fifty Years Of Bond Style opened to the public on Friday 6 July and will run until 5 September 2012 when it will then tour internationally over a three year period. From Ursula Andress’ white bikini, Scaramanga’s Golden Gun and Oddjob’s steel-rimmed bowler hat to the modern day state-of-the-art technology and original storyboards, DESIGNING 007 – FIFTY YEARS OF BOND STYLE brings together for the first time 400 gadgets, vehicles, props and artifacts for a multi-sensory celebration of Bond style. The white bikini worn by Ursula Andress in one of cinema’s most celebrated scenes joins more than 400 Bond archive items alongside a faithful recreation of the trunks Sean Connery wore in Thunderball in a new and highly anticipated Barbican exhibition commemorating the 50th anniversary of the James Bond film franchise from 1962’s Dr No to this year’s Skyfall. 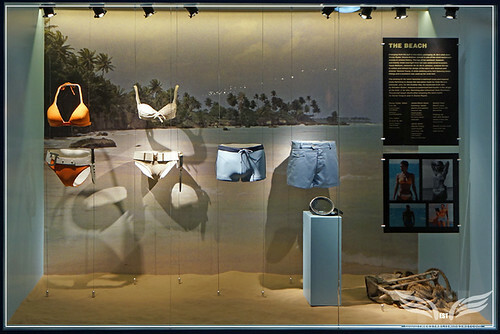 The items are displayed alongside those which they later inspired – the orange bikini worn by Halle Berry in Die Another Day and Daniel Craig’s sky blue trunks from Casino Royale are among 400 works comprising the DESIGNING 007 – FIFTY YEARS OF BOND STYLE exhibition, which opens at London’s Barbican Centre on 6 July 2012. Exhibits on display also include Scaramanga’s Golden Gun from The Man with the Golden Gun, Oddjob’s steel-rimmed bowler hat and the proto-type of Rosa Klebb’s deadly flick-knife shoes worn in From Russia with Love, Tee-Hee’s metal arm from Live and Let Die and Jaws’ fearsome teeth, which first appeared in The Spy who Loved Me. Vehicles and gadgets on display include the 1964 Aston Martin DB5, which famously returned to the screen in GoldenEye; Pierce Brosnan’s BMW motorcycle from Tomorrow Never Dies; the attaché case featured in From Russia with Love and Pierce Brosnan’s state of the art Ericsson mobile phone from Tomorrow Never Dies. They take their place alongside original graphic drawings and models including the design for the Jetpack piloted by Bond in Thunderball; the storyboard for the action sequence in You Only Live Twice featuring mini-helicopter ‘Little Nellie’, together with the miniature ‘Wet Nellie’ Lotus Esprit used for filming in The Spy Who Loved Me. 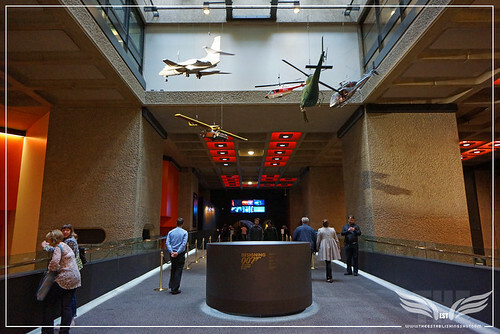 The exhibition transforms many of the Barbican spaces, including The Silk Street Entrance, the Curve gallery, the Pit theatre and some of the public foyer spaces, taking visitors on a journey through themed rooms and environments reflecting fifty years of Bond style. Guests of DESIGNING 007 – FIFTY YEARS OF BOND STYLE enjoyed a selection of James Bond-inspired drinks and canapés, including confit duck pancakes with lime and sweet chilli; caramelised fig, cashel blue and walnut croute; smoked salmon blinis with Avruga caviar; glasses of James’ champagne of choice, Bollinger, and the legendary Martini bar, shaken, not stirred.